For People Who Care, Call Poudre Valley Air for your Heating and Cooling Needs! We proudly offer long-lasting and energy-efficient Trane products. Let us help you pick the right products for your space. Explore our high-quality heating and cooling products and choose the equipment that will help you achieve your comfort control goals. We offer Trane products because consumer reports have rated them as #1 in heating and air conditioning systems. From heating and cooling to humidification and air purification, let our comfort consultants guide you through the options, so you can feel confident your home or commercial space will be comfortable and healthy throughout the year. Browse through the wide range of energy-efficient HVAC products at Poudre Valley Air. We cover all manufacturer warranties on our products and services. For FREE estimates, call us at 970-493-2050. Our friendly staff will answer your calls 24/7. Whether you need a new AC or heater installed in your home or office, get in touch with us. You can call us 24/7 to discuss your HVAC needs with our comfort consultants. Let us help make residential and commercial HVAC projects easier with the Home Projects Visa credit card. You might also like to check out our monthly special plans. Call us at 970-493-2050 for FREE estimates on your HVAC job. 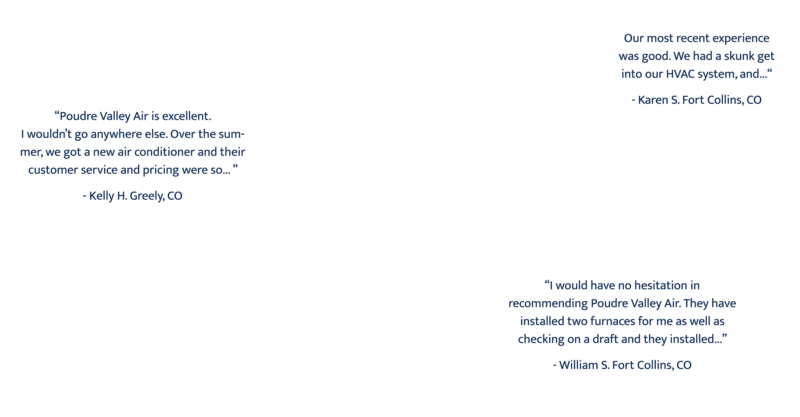 Here is what our customers have to say about the HVAC services provided by Poudre Valley Air. We have been serving Fort Collins, Greeley, Loveland, and Longmont, CO, and Cheyenne, WY since 1973. We work with comfort consultants who undergo continuous industry training to be well equipped in latest advancements in the industry. We also offer convenient financing options for easy payment process. Call us at 970-493-2050 for our 24/7 services.